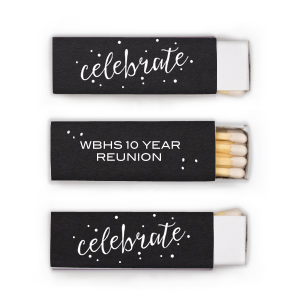 Such a huge accomplishment deserves major celebration, all the way down to your custom designed retirement party lipstick matchboxes! Design your personalized retirement lipstick matchboxes and take advantage of have 3 sides to feature your unique touch. 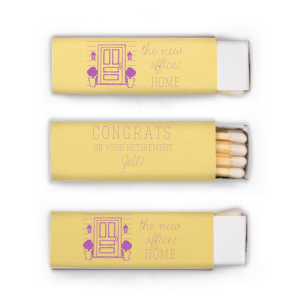 Celebrate your new found freedom in personalized style with custom designed retirement party lipstick matchboxes! You’ll love how easy it is to customize your personalized retirement lipstick matchboxes. Named for their shape, so similar to a lipstick box, your customized retirement party lipstick matchboxes are a fresh take on a classic party favor. 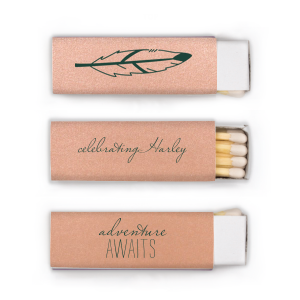 Your party guests will appreciate your personalized retirement party lipstick matchboxes as a useful momento of your milestone moment. Choose from an array of paper colors and foil stamping color and sheen options to coordinate your custom retirement party lipstick matchboxes with your party theme, then browse our design idea galleries for inspiration. Design your personalized retirement party lipstick matchboxes today!